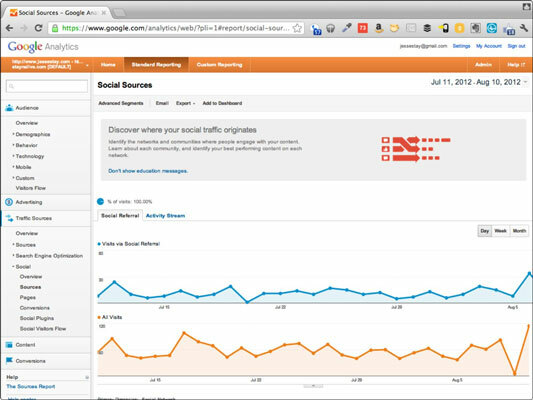 Google Analytics allows you to learn which social channels are providing the greatest traffic. From Google Analytics, you can determine whether Facebook, Twitter, Google+, YouTube, or other social networks are providing traffic to your website and which pages on your website are getting the most traffic from those channels. 1.Go Error! Hyperlink reference not valid. This is where you go to get all your analytic data from Google. If you haven’t set up your site for Google Analytics, you’ll want to do that first. You can always click Help if you have questions. Google Analytics has a terrific Help section. All information about where your traffic comes from is stored in this section of Google Analytics. Click Social under Traffic Sources. 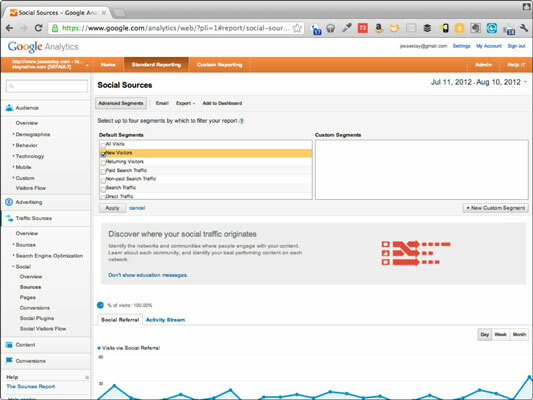 Doing so expands the options available for monitoring the traffic that comes to your website from social channels. If you want a bird’s-eye view, you can look at the Overview section under Social. This is where you need to be. In this submenu, you can see a list of all the social networks that are providing traffic for your website. 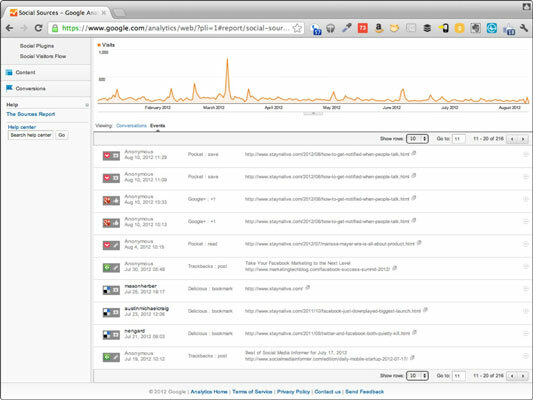 You can even break down that data by activity stream and see who on Google+ is linking to your website. Browse around the Sources section — check out the various ways you can get the lowdown. If you explore this section a little, immediately you’ll notice a graph of all the visits driven by social networks for your website. Below that you see a corresponding graph that shows total visits to your website. Compare the two graphs, and you can spot any correlation to the spikes you see in your total traffic. From there you can get a bird’s-eye view of social channels as drivers of your traffic. You can also adjust the time period as needed. Evaluate how much of a role social channels play in driving traffic to your website. Just comparing the two graphs can give you a good idea of whether social channels are primary influencers of traffic for your website — and what items on your website get the most social traffic. Zeroing in on those attractive items can help you decide how to share your website on your social network channels. Break down the traffic to your website by social network. Below the graphs you’ll see a list of the social networks driving traffic to your website. From this you can see which social networks are the most influential in driving traffic for you. This list can give you some strong hints about which social networks you should be more involved in. Also pay attention to the growth of traffic from each network. See one growing faster than another? If so, maybe it’s time to give that network some more attention. See which pages on your website are getting the most traffic from particular social networks. Click any of the social network names in the list below the charts, and you get a view that shows pages on your website that are being linked to from social networks. Here you can tell which pages are attracting the most traffic. This can help identify the content your social networking audience likes. Evaluate how many new visitors social networks are driving to your website. If you click Advanced Segments at the top of your Social Sources page in Google Analytics under Social, you have the option to narrow down the audience you’re looking at. If you want to see how many of those visiting from each social networking channel are new visitors, check the box next to New Visitors (and then be sure to click Apply). Doing so shows you stats that reflect how many new visitors are being driven to your website by each social network. You can also click through and figure out which articles attracted the most new users. Play around with the Advanced Segments box. There are some interesting demographics you can tie into these stats, and they’ll only get better as Google integrates more social factors into its analytics. Track conversations about your website on Google+. This is a powerful feature. Next to the Social Referral tab there is an Activity Stream tab. Click that, and you’ll see an activity stream made up of social mentions of your website. Here you can see everyone talking about your website on Google+ and even a few other supported social networks (such as Delicious). Identify when people are interacting with your website on other social networks. Also under the Activity Stream tab, you can click the Events link below the activity stream. This will show you a list of events — instances of people interacting with your website. If (for instance) someone links to your website and provides a trackback, that event appears onscreen for your perusal. Or, because Delicious has partnered with Google Analytics, every time someone bookmarks your website on Delicious, you’ll see that bookmark in this section. You can even see who bookmarked you (handy info).